What is the company Home page? 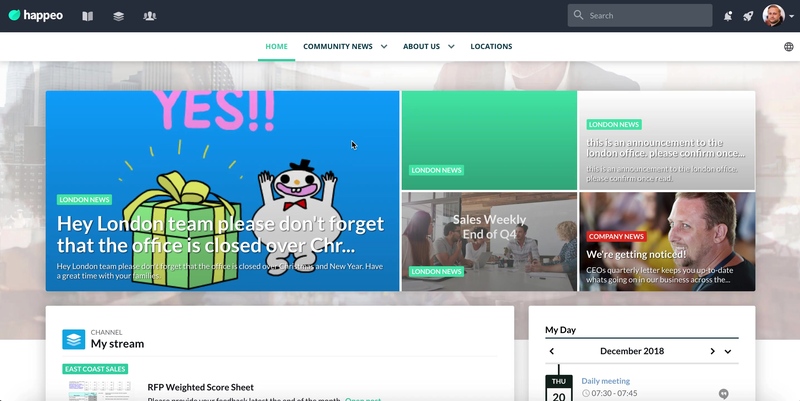 After signing in to Happeo you will land on either the My Stream -page or a Home page this will depend on your Happeo environment settings defined by your company administrator. This article is for the Home page which is the more traditional intranet style landing page. The Home page is set up by your content managers and can be customised to include many different pieces of information. Each Home page will look unique and depends on how your content manages have designed it. Even if your administrator has set the landing page to a Home page you can always access My Stream through the Channels menu. As each Home page is different and can be updated by your content managers you can always provide feedback internally about how to make the Home page relevant and useful. The Home page can be created in the same way as all other pages to find out more about this here.